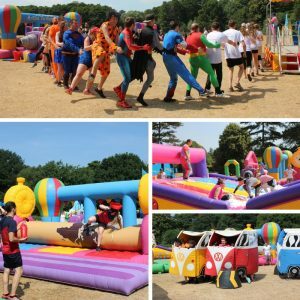 On Saturday 8th June, Jigsaw Trust will be hosting ‘It’s a Knockout’ at Shalford Park, Guildford, for teams of 10 people to compete in. Based on the popular 1970s television show, teams will compete against each other on a giant wet-and-wild inflatable assault course. It’s a fantastic opportunity for friends, family or staff teams to get together as part of a team bonding exercise and you will be competing against other teams whilst raising much needed funds for Jigsaw. A £200 deposit is required to secure a spot. Teams are then asked to raise a minimum of £800, just £80.00 each based on a team of ten, and Jigsaw can help with ideas and advice on how to raise funds and make the occasion enjoyable from start to finish. There are morning and afternoon sessions available so the event will only take up half your day but will make a lasting impact on children and adults with autism. To download a registration pack click here or email [email protected] directly.